As pet owners, our main job is to take care of our pets. This includes feeding them adequate meals and portions, filling their water bowls, taking them for walks or playing indoors for exercise, and, of course, giving them lots of love. Another one of our jobs as a pet owner is to take our pets to the pet doctor or veterinarian for regular check-ups and when we suspect something is wrong. Thus, when we see our dogs’ heads trembling or shaking for no reason, we get worried. Of course, our dogs can’t tell us what’s wrong with them or why they’re doing it. First stop is a call to your local veterinarian. Head tremors can be a symptom of many issues or illnesses in dogs. Often, when a neurological issue is found, your local veterinarian will refer you to a specialist — in this case, a neurological veterinarian such as Veterinary Neurology & Imaging of the Chesapeake in Annapolis, Maryland. Like other neurological veterinarians, we specialize in the diagnoses and treatment of neurological disorders in pets. Usually, we rule out conditions to narrow down the diagnosis. ARE HEAD TREMORS DANGEROUS IN DOGS? Head shaking or head bobbing in dogs is known as idiopathic head tremors. Idiopathic means the cause is unknown and the condition occurs spontaneously, similar to seizures. However, seizures do have known causes. 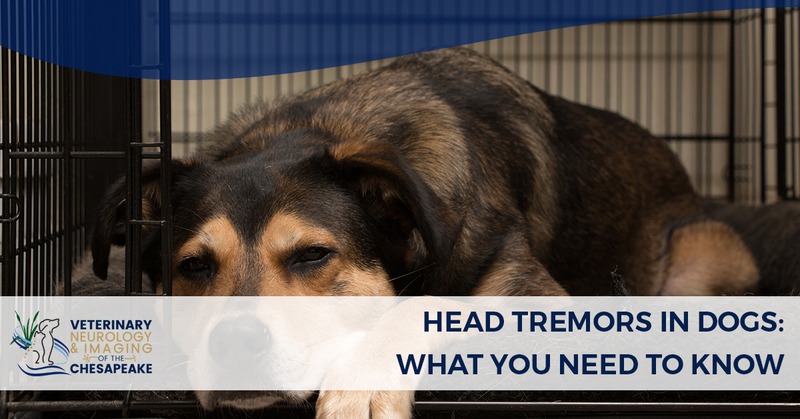 Idiopathic head tremors are commonly seen in older dogs and some breeds are more susceptible than others such as boxer, spaniels, labrador retrievers, and bulldogs. The important thing to know here is this: tremors are not dangerous and, dogs being dogs, it probably doesn’t even bother them. Know this is not uncommon and, after having seen a veterinary neurologist who diagnoses the head tremors as idiopathic head tremors, you can rest easy. The majority of us treat our pets as members of the family. We love them from birth to death and beyond. It pains us probably more than them when there’s something wrong with them, and we can’t fix it. But we can take our pets to specialists such as Veterinary Neurology & Imaging of the Chesapeake who specialize in pets’ tremors and other neurological disorders such as deafness in pets (which is determined by a test known as BAER testing). As pet owners, we are entrusted with the care and well-being of those animals in our lives. We do our best with what we have given the circumstances. No one likes to see our pets under stress or in pain. But we can do something about it — we can take our pets to neurological specialists to be diagnosed and treated. Veterinary Neurology & Imaging of the Chesapeake cares for your pets. We treat our patients as our own, doing everything in our power to discover the cause of the pet’s symptoms and prescribe a treatment option moving forward. We specialize in all disorders of the nervous system, and if you suspect your pet of having a neurological disorder, please reach out to your primary veterinarian. He or she can guide you in the right direction by doing a preliminary analysis. Then, if your primary veterinarian deems so, you’ll be referred to our practice. Here, we’ll explore every possible option for your pet. We offer MRI services for when an X-ray is insufficient to see inside the body. We offer spinal taps (CSF Tap) to test for viruses that cause meningitis or cancers that attack the nervous system. At Veterinary Neurology & Imaging of the Chesapeake in Annapolis, Maryland, we also look for diseases of the muscles using electromyography (EMG) or Nerve Conduction Velocity (NCV) tests. Finally, we offer veterinary neurosurgery to fix herniated disks or even brain disorders if need be. Our staff at Veterinary Neurology & Imaging of the Chesapeake treats all of our pet patients as if they are our own with compassion, tenderness, and affection. Our veterinary neurologists are top in the nation for diagnosing and treating neurological disorders in pets. Visit us today!